Late last year, I explored to Peru for two weeks. It was one of the most spectacular and wild trips I’ve been on. I have so many friends and readers who have Peru high up on their bucket lists so I decided to pull together my top list of things to do in Peru. This list is perfect for those wanting to explore Peru, but also a few other countries in South America as well as those who are just exploring Peru. Enjoy! MACHU PICCHU There are many things to do in Peru, but you can't visit without seeing Machi Picchu. Known as one of the new wonders of the world, a trip to Peru without seeing Machu Picchu is like exploring the red centre of Australia but not seeing Uluru, or adventuring around the pyramids in Egypt. The story of Machu Picchu is an incredible one. Built between 1450 and 1460, the Incas abandoned Machu Picchu in 1538 fearing the Spanish would discover their sacred city. Sadly the city was never completed nor did the Inca’s return – they were obliterated by the Spanish. In fact, Machu Picchu wasn’t discovered until 1911 by American explorer Hiram Bingham. Find out more about Machu Picchu and download my free guide here. CHOQUEQUIRAO There are many hikes in Peru, the most popular being the Inca Trail to Machu Picchu. But I bet you haven’t heard of the hike to Choquequirao. Known as the toughest hike in Peru, it may not be as popular as the Inca Trail but it is by no means less spectacular. But be warned – you need to train properly for at least three months in advance. This high altitude hike is not for the faint hearted. You need to be fit, and pack the right gear. I highly recommend hiking boots, hiking clothes and walking poles from Kathmandu. Temperatures reached 45 degrees when I did the hike in late November so make sure you bring a hat and plenty of sunscreen. And go with a tour guide with mules to carry your tents, food, water and other equipment. The four day, three night hike takes about two and a bit days in total of non-stop hiking. And the distance? 45km. Too easy? Think again. But I am so stoked to have completed this hike. There really is nothing better than finishing this trek – such an accomplishment. Utterly memorable! So get off the beaten tourist trek and make sure you add this on your list of things to do in Peru - you won't regret it! Quick Tip: With hiking boots, make sure you buy one size too big as hiking down steep hills can rip the nails off your toes. I haven’t experienced this but you only have to read the book Wild to get an idea of what I am talking about. Additionally, wear proper socks (yes please spend the money), choose a hiking boot that protects your ankles and tie your laces very tightly. LAS SALINAS DES MARAS The Maras Salt Flats was one of the places I was most excited about. It has to be one of my favourite things to do in Peru - easily. It's just so different than anything else I've experienced. You only have to look at my photos below to see what I am talking about. But what is Las Salinas Des Maras? Since pre-Inca time, salt has been harvested in Maras by evaporating salty water from a natural underground spring. The stream is directed into a complicated system of miniature channels constructed carefully so that the water runs down and over thousands of terraced ponds. Working the salt ponds require a cooperative system which was established during the time of the ancient Incas. As water evaporates from the sun drenched ponds, salt precipitates into various sized crystals on the walls and floor. Within a few days the caretaker of the salt flat carefully scrapes the dry salt from pond. Interesting to note, the colour of the salt varies from bright white to a light brown. This all comes down to the skill of the community tending to the salt flats. To find out more about the ancient salt flats and how to get there, read my blog post here. HUACACHINA OASIS Google ‘Huacachina Oasis’ and just look at the images. I’ll wait a couple of minutes whilst you do. Ok, have you had a look? If so, then I am quietly confident you will understand why visiting Huacachina is an absolute must when you find yourself looking for the best things to see and do in Peru. Take a look at my photos below – it’s spectacular! 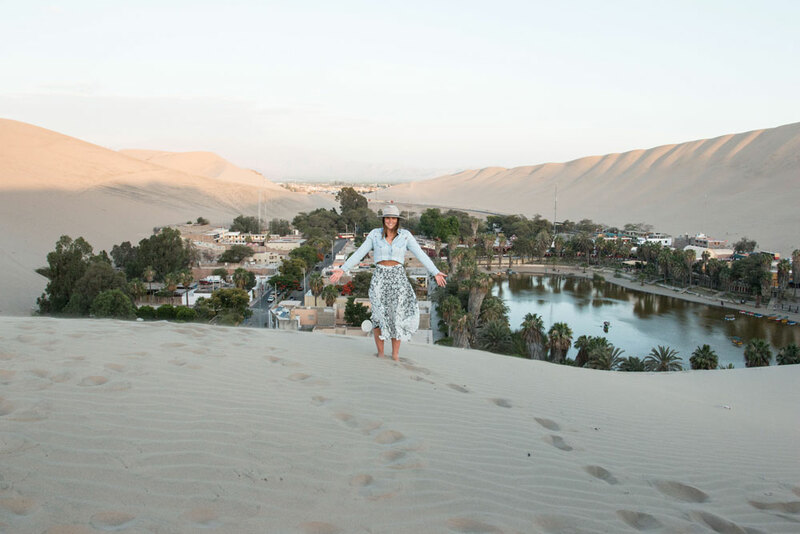 For more information on what to do when you get there, visit my blog post on Huacachina here. PARACAS SAND DUNES There are so many things to do in Peru and in terms of deserts, you're spoilt for choice. If being thrown around in a 4WD whilst being driven fiercely over steep sand dunes and enjoying dinner on sunset under the canopy of a large tent isn’t your jam – then what the hell is wrong with you?! Kidding. But kind of not. Paracas is 270km south from the capital city of Lima and the sand dunes are otherworldly to say the least. Make sure you check out my four reasons for visiting the Paracas sand dunes here. NAZCA LINES There are some places in the world that everyone needs to visit at least once in their lives; the cenotes in Tulum, the pyramids in Egypt, the Great Wall in China, Uluru in Australia and without a doubt, the ancient Nazca Lines in Peru. And whilst I know there are so many things to do in Peru and sometimes time is not our luxury, please promise me you'll at least do this! A series of ancient geoglyphs located in the Nazca Desert in southern Peru between the towns of Nazca and Palpa (about 400km south of Lima, Peru’s capital city), the Nazca Lines aren’t like anything I’ve ever seen. The area itself stretches more than 80km and it best accessed by small aircraft. Visiting the Nazca Lines is an absolute must and you can read up on my trip here. Is there anywhere else in Peru that you also think is an absolute must to see and do? I would love to hear your suggestions! MEET ME AT THE NETWORX ‘SUPERSTAR BLOGGERS’ EVENT IN SYDNEY!